As you can surmise, my initial enthusiasm was less than palpable. I would hesitate to say that anyone “invented” the patty. Flattened discs of pan-fried food seem to be commonly found everywhere, and I imagine that the technique goes as far back to when humans started smushing things together to eat. Maybe it didn’t get codified until much later, but I’m not sure that really matters much as this is the case for a lot of foods. Main ingredient(s): some kind of ground protein (meat, poultry, seafood, beans or nuts) and/or vegetables. Binders: eggs, flour, breadcrumbs (fresh or packaged), bran, tofu, mashed potatoes or any kind of mashed vegetable or legume. Moisteners: water, milk, sour cream, mayonnaise, sauces, mustard, chopped spinach, shredded carrots or zucchini, shredded apples, anything that would add extra moisture if needed. Technique: shallow pan-frying or baking. Frying fat: butter, rice bran oil, canola, olive oil, ghee, or any other kind of oil with a relatively high smoking point. Can you believe that I am such a food nerd that it was actually the 3.5 single-spaced pages of technical patty construction talk that sold me on the idea? And as tempting (and easy) it would have been to have come up with a recipe on my own — ideas that I had? shrimp, chili pepper, and cilantro patties with some kind of scotch bonnet relish, or something Cantonese-ish like shrimp, corn, and egg whites — the fact is that I have been so overwhelmed with work and school lately that I haven’t had much time to devote to fun things like cooking challenges. So, dear Readers, please do forgive my inability to milk any extra creative juice out of my brain right now! These wonderful little quinoa patties are from Heidi Swanson‘s Super Natural Everyday cookbook. They are great for lunch or a light supper. I only made half of the recipe because I just had a cup and a half of leftover quinoa, but you should certainly make the full recipe by doubling the amounts that I list below. 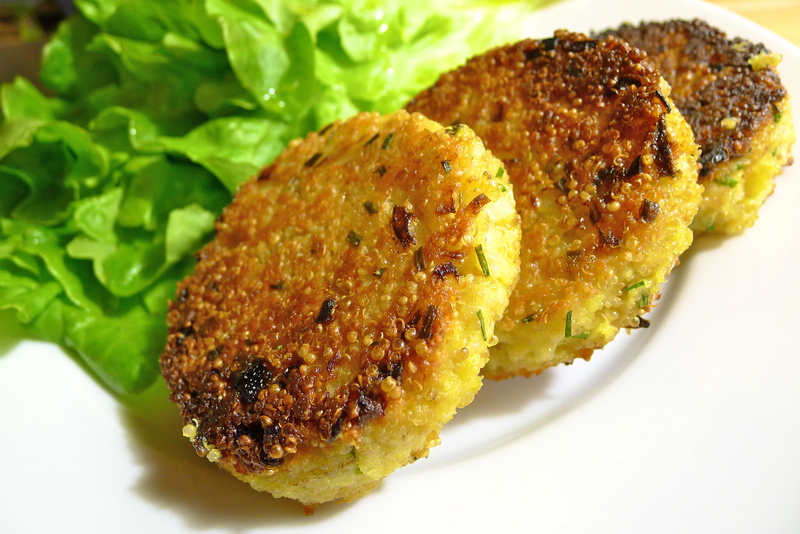 The patties keep exceptionally well, and reheat easily in the oven. One thing I learned from the challenge? My strong suspicion that my stove sits on uneven flooring is once and for all confirmed: all the oil slid to one side of the cast-iron pan while cooking, resulting in patties that were darker on one side than the other. As soon as I get the time, I’m going to get in there and stick some little wooden wedges under the stove to even it out. Thank you again Lis and Audax for the technical exercise and great challenge. And isn’t Audax just the best name ever? 1. In a large bowl, combine the quinoa and the eggs together with a good pinch of salt. Add the chives, the onion, the Parmesan, and the garlic. Stir in the Panko, and let the mixture sit for a few minutes so that the breadcrumbs can absorb some of the moisture. 2. After a few minutes, you should be able to easily shape the mixture. If it seems a little wet, you can add more Panko to firm up the mixture. Conversely, if you find the mixture too dry, you can add a little water to loosen it up. Swanson recommends erring on the moist side so that the patties won’t be overly dry — which is what I would recommend as well. As I left the quinoa mixture on the moist side, I found that it was easier to use a ring mold to make the patties instead of using my hands to shape them. Set a ring mold on a plate and fill it with about three heaping spoonfuls of the quinoa mixture. Spread the mixture out evenly in the mold. Lightly compress each one by pressing on the top of the patty with the bottom of a spoon. Carefully remove the mold. Continue until you have used up all of the quinoa mixture. You should have about 6-7 patties total (or about 12 if you make the full recipe). 3. Heat the olive oil in a large cast-iron skillet over medium-low heat until it begins to shimmer slightly. Using a thin, flexible spatula, carefully transfer the patties to the skillet. You should be able to fit in all six with a little room in-between each one. Cover the skillet and let the patties cook for about 7-10 minutes. The bottoms should be deeply browned, but not burnt. Carefully flip the patties and cook them on the other side for about 7 more minutes. When both side are evenly colored, transfer the patties to a paper towel-lined plate. I should try this one month, it sounds fun. It clearly works too, these look really delicious! I do love a good patty. Until the challenge, I had forgotten how great patties can be. If you do try it, let me know how it goes! I love the whole concept of patties because they are so versatile. I wonder how those patties would fair on a grill? Do you think they would stay together? They look like a marvelous alternative to a regular burger. True! They are super versatile, which is why I feel a little lame not coming up with my own! My brain is just toast right now, though. If you were to do these on a grill, I would definitely firm them up with more breadcrumbs so they would fall apart. The ones I made were pretty moist, so it was a little challenging transferring them from the plate to the pan. These would definitely be a good start to building a great veggie burger! Make ’em bigger! We like quinoa, so thanks for the suggestion. Thanks! I actually made them again tonight. Am a victim of my own blog! WOW I’m impressed with your marvellous result, the colouring is wonderful! Yes your oven needs levelling LOL LOL. And thank you for the kind words about the technical notes and information (for a basic challenge challenge you need lots of tips and hints so the cooks will be able to do outstanding examples). And yes Audax Artifex (my real name) gets lots of (mostly) positive comments heeeheeee. Cheers from Audax in Sydney Australia. Thank you! I thought the challenge was amazing. I definitely appreciated all the time and effort that you put into it! It was such a great exercise in technique, and I learned a lot. Audax Artifex! That is seriously the best name on the planet. I wish my name was that cool! Thank you again for the great challenge! Looks very yummy! Can be nice on bread too! Thanks, Malou! It definitely makes me think about possibilities of veggie burgers! I can make really good beef patties and kebabs… I like to add pine nuts, mint, and honey to the mix. Ooooh, that sounds really good too. I like the mix!